AZ Metals specializes in both small bundle quantities of metal and larger production quantity orders. We are a steel supplier, as well as, an aluminum supplier, stainless steel supplier and copper supplier! You will find a vast selection of metals to choose from and a great variety of shapes. Let us know what material you are looking for and the size and grade you want, and we'll be happy to assist you. Looking for steel tubing , expanded metal or a sheet metal supplier? We have you covered, plus we have the ability to source hard-to-find metals with over 19,000 line items that we can bring in to meet your needs. The services we offer have expanded and we now offer metal fabrication with a full time welder on staff! See our Services tab for more information. Our metal supply service center offers convenient delivery or shop and go. Deliveries are made daily throughout the East Valley and beyond. 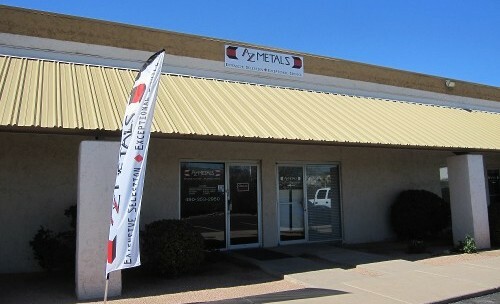 When you are searching for metal near me, you will find that the selection at AZ Metals is extensive! Our customers always come first, and we will do everything we can to get you the metals you need. In addition, our metal for sale is lower priced than home improvement stores, and all orders are cut to size, making us a valuable resource for builders, landscapers, repair and maintenance departments, fabricators, DIYers, and the local handyman. Simply fill out our contact form and submit. We will contact you shortly! AZ Metals is a family-owned-and-operated, full-service metal supply center providing wholesale and retail prime metals cut to the size you need. We have served the residential, commercial and industrial metal supply needs throughout the East Valley and beyond since 2011 and have been a metal supply source in Arizona since 2001. Backed by over 35 years of experience, we have the knowledge and expertise to provide quality services you can count on. "To meet the needs of both wholesale and retail customers by providing an extensive selection of metals cut to size with exceptional service." Doors open 8:00 am M-F & 9:00 am Sat. We are conveniently located south of US-60, just east of Mesa Drive.